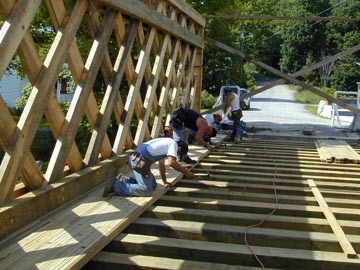 The reconstruction of Montgomery's Fuller Bridge is progressing rapidly, to the delight of the townspeople visiting the site. 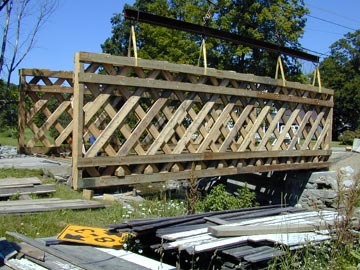 Dismantling began on April 26 and completion of the bridge is slated for August 15, said Marc Cote of Blow and Cote Inc., General Contractors of Morrisville, Vermont. Phil Pierce, consulting engineer, designed the replacement floor system. The winning bid for the contract was $170,000, Cote said. The first truss was started on June 15 in the Montgomery Town Garage lot and completed in ten days. The second truss was built on top of the first and completed in six days. 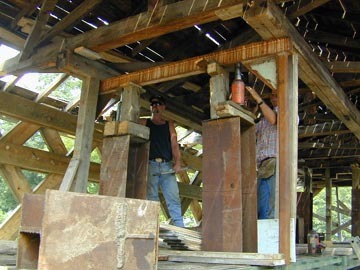 Assembly of the end posts into the trusses took one day each. The first truss was set across the river on Friday, July 8. The second truss followed on Wednesday, July 12. Asked what he found when his team dismantled the bridge, Cote replied: "The upstream truss was hit during the flood with all kinds of debris, wood, trees, whatever. All of the lattices were broken off and the bottom chord on the abutment was rotted right off. That's why they had the beam on the upstream side." 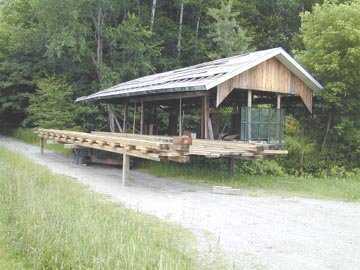 There is no salvage except for the roof, which was rebuilt after it was torn off in the winter of 1982 by a logging truck. 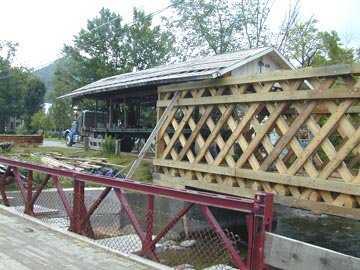 Eric Gilbertson and the Covered Bridge Committee came when the trusses were down, said Cote. 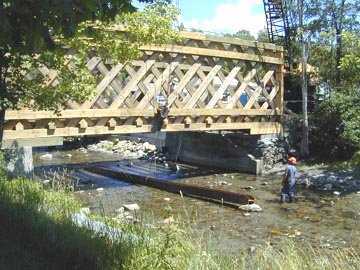 "They knew the upstream truss was no good but they wanted to inspect the down stream truss. We found that there were a few salvageable pieces, but they were so few, that it only made sense not to use them because they had rotted where they were touching each other. The rot isn't all the way through the lattice planks, but it's a failed piece of wood so necked down that it didn't make much sense to try to use it. "The committee was thinking maybe we could use this lattice [plank] and this chord [piece]. I told them that you can't do that because we can't match holes. The holes were in a random pattern. They weren't done with a template. The other thing that was peculiar about this bridge is that the inside lattices were shorter than the outside lattices. That made it so that the squares were not symmetrical, they were a little oblong. We think that's the last bridge that the Jewetts built and they used up all their pieces because all the chord planks were short. There were six, maybe seven chord pieces to go across the bridge and it's only a fifty-foot bridge." 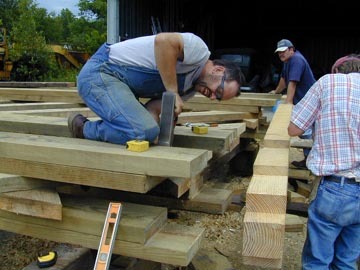 In the photos above, Albert Lauzon, Roland Blais, and Nathan Cote have completed construction of the trusses and are fitting the end-posts. 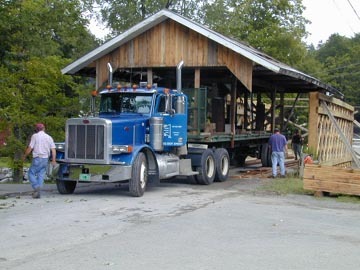 A completed truss stands by the trailer-born salvaged roof. 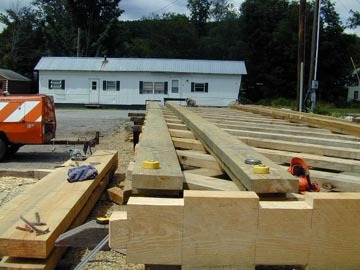 The deck beams, sculpted to fit through the lattice have been threaded through the truss while truss is still supported by the crane. Roland Blais guides the removal of the steel girder used as a temporary deck support. The team installs the nail-laminate floor. The roof is eased over the new trusses. 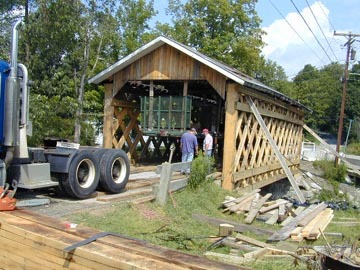 Nathan Cote moves the trailer-born roof-structure onto the bridge. Hydraulic jacks are set to lower the roof into place. The roof is in position. Final adjustments will be made and the trailer will be withdrawn.